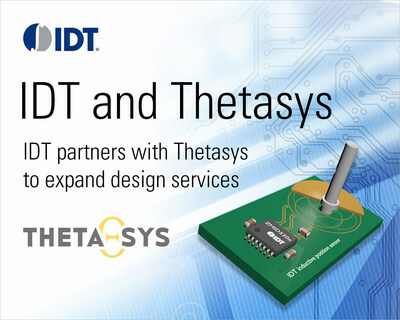 IDT and Thetasys LLC Announce Partnership to Expand Design Services | Integrated Device Technology, Inc.
SAN JOSE, Calif., June 19, 2018 /PRNewswire/ -- Integrated Device Technology, Inc. (IDT) (NASDAQ: IDTI) together with Thetasys LLC, today announced a partnership agreement in the United States and China for collaborating on design services and support for its sensor customers. Thetasys LLC is a technology development company with more than fifteen years of combined inductive sensor design experience and multiple patent submittals addressing inductive sensing solutions. The Thetasys team has helped develop a wide range of commercial, industrial, and automotive solutions, including applications which required compliance with ISO26262 functional safety standards. IDT's contactless position sensor solutions are magnet-free, significantly reducing materials costs while providing immunity to magnetic stray fields – a mandatory requirement for many applications. Instead of magnets, the inductive position sensors interface with low-cost PCB-based coils and simple metallic targets, providing single-chip design flexibility for rotary end-of shaft (on-axis) sensors, rotary side- and through-shaft (off-axis) sensors, linear motion sensors, and arc motion sensors. The IDT® sensors are capable of small angles up to full 360° absolute angle sensing and short to very long strokes. The devices are AEC-Q100 automotive-qualified and ISO 11452-8 compliant, making them suitable for use in a wide range of automotive, industrial and consumer applications. "Our partnership with Thetasys LLC opens up new opportunities and resources for our sensor customers," said Mario Montana, Vice President and Corporate General Manager Automotive & Industrial Group, Executive Staff. "With our combined expertise in inductive sensing, we are dedicated to providing our customers with reliable solutions to accelerate their time-to-market." Tim Jackson, Director and co-founder of Thetasys LLC added, "We are excited to partner with IDT to advance the adoption of inductive sensing technology. Combining IDT's highly competitive ZMID520x family of inductive sensing IC products with Thetasys inductive sensor design expertise will help customers accelerate their sensor product developments while growing internal inductive sensor design capabilities." Visit the idt.com/position to find out more about IDT's position sensors and www.thetasys.com to learn more about Thetasys. Thetasys LLC (www.thetasys.com) is a privately-held engineering company focused on the development of technology and products for sensor and sensor network applications. Thetasys has extensive experience in the design and application of inductive sensing technology, in addition to ISO26262 functional safety certification relating specifically to the implementation of inductive sensor technology in automotive applications. Thetasys is located in Orange County California.